Only because I don't have kids in school, can I say this is my most favorite part of summer. The crowds that fill up the beaches and cause traffic start to taper off. The breeze cools off the extra warm days and the corn, oh that sweet corn that doesn't even need anything on it. Kids return to school, we take liberties to call early work days and spend late afternoons at the beach with enough space on all sides that someone else isn't listening to your conversation. I am a personality that thrives on getting things done - being efficient - but I married a man who lives so well in the present; he sees what is right in front of us when I so often want to put my head down and plow forward. SO glad there have been afternoons of stopping and watching my boys play in the surf. Hugh has been asking for a fresh fish sandwich for a while now and I don't know why it took us so long to get around to it (aside from fish having a season... salmon and halibut, get to it!). This came together so quickly that I will for sure make these next time we have company. Perhaps they are too simple to share but these days, cooking with a toddler either trying to touch the hot BBQ or throw gravel into the fire pit, this is what I can muster up. This could easily be doubled to make four sams as I know that's a common number to feed. Account for 5-6 ounces of fish per person. I prefer a lot of slaw, likely offering more heft than fish but it needs that fresh crunch. There may be some leftovers based on taste. I know some people are sketchy on mayo but in the slaw, you don't taste it, it merely gives the dressing some viscosity. I have heard good things about this product if you're wanting a super clean version. The recipe works perfectly well with some wild salmon, a marinated tofu steak etc. It's a simple sandwich but just right for summer meals. Cut the filet in half so you have two square pieces. Sprinkle both sides with salt and pepper and rub it generously with grapeseed oil. Preheat your grill to medium heat. To make the slaw, set the slicer blade in your food processor (alternatively you can use a mandoline or careful knife skills). Slice the cabbage extra thin. Do the same with the onion and jalapeno. Collect them in a mixing bowl and add the cilantro. Into the bowl, add the mayo, grapeseed oil, rice vinegar, sugar and a few pinches each of salt and pepper and toss well to dress. Set aside in the fridge. Clean your grill and oil the grates. Grill the fish for 4-5 minutes on each side depending on the thickness of your filet. It should feel like the meat of your thumb joint when cooked medium which is perfect here. Brush the buns with oil and grill them just to warm through. To assemble the sandwich, cover the bottom bun with avocado slices, then the fish filet and a healthy amount of slaw on top. *For the sriracha mayo, we do one part sriracha to two+ parts mayo. It's similar to what you get with a roll at an Americanized sushi restaurant? Spicy, but not mouth burning. Adjust to your spice preference. Though it's not our ‘American way’, I much prefer a nice lunch as opposed to dinner. 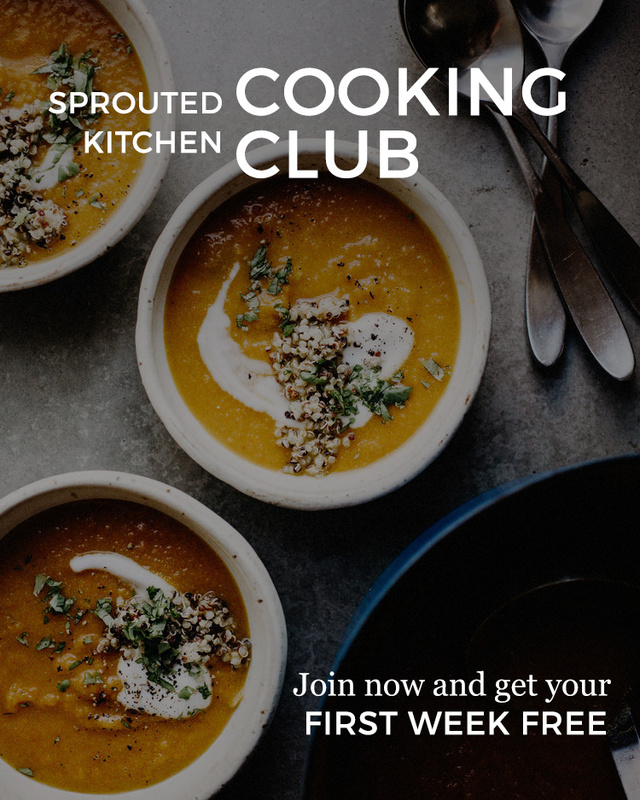 Hugh and I set forth on this inaugural blog endeavor, with a protein and veggie packed meal in mind. White fish is such a wonderful canvas for flavor options. And the beauty of this combination is that ingredients such as these, can typically be found year round. We’ll attribute this entry to a fusion of California/Hispanic flavors. The toaster oven is the wonder poodle of all cooking devices. Less hassle, quick cooking time and close heat so you get a bit of crispyness. We didn't grow up with one in our house, which is possibly why I now find them so remarkable. This recipe may require a bit of chopping, but it is far from complicated. Just double or triple it for a dinner party, the slaw can be done a day ahead and will save wonderfully. ** Any spicy herb mix with do, every brand makes one. Or just plain chili powder works fine, it is a blend anyways. Working in a large mixing bowl for the slaw. 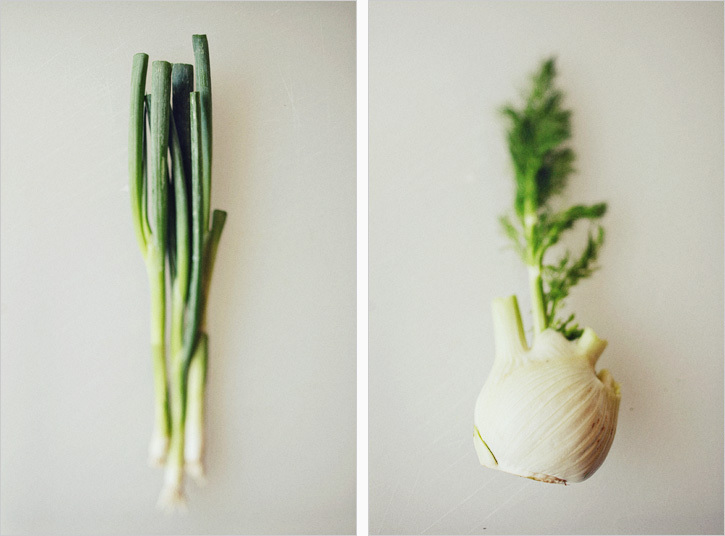 Cut fennel bulbs in half length wise and slice thin, discarding the touch end. Zest both grapefruits with a fine grater or micro plane. 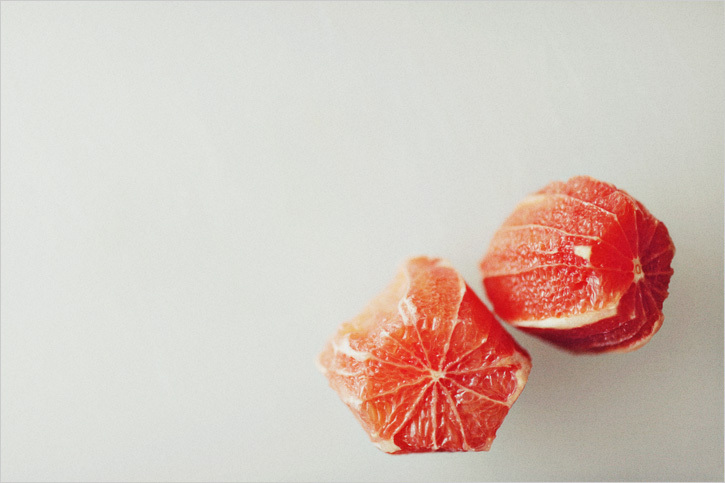 Cut the peel and pith off the grapefruits so there is no white, just pink fruit. Segment the grapefruit in small slices over the mixing bowl, so the juices fall in as well. Add cilantro, green onions, olive oil, 1 tsp. of the salt and a few generous grinds of the pepper. Mix well to incorporate all flavors. Pat fish filets dry and poke a few holes in them with a fork. In a small baking dish, sprinkle the fish with the juice of the lime, salt, pepper and your spice blend of choice. Rub it around with your fingers so it gets into the fish flesh. Vivid, aren’t I? Put the baking sheet on the top rack of the oven and bake the fish for about 12 minutes (you need to watch it as each oven size will cook at different speeds, DO NOT overcook). Take it out just as fish is firm to the touch. Let it sit for a few minutes. 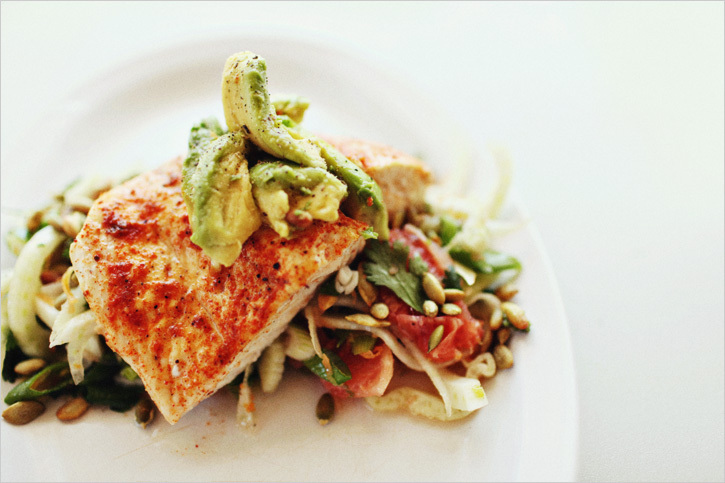 On each plate, put a heaping amount of the slaw, a handful of toasted pepitas, the fish, and avocado slivers on top. Always building up my friends. Enjoy with a side of brown rice or some warm tortillas.